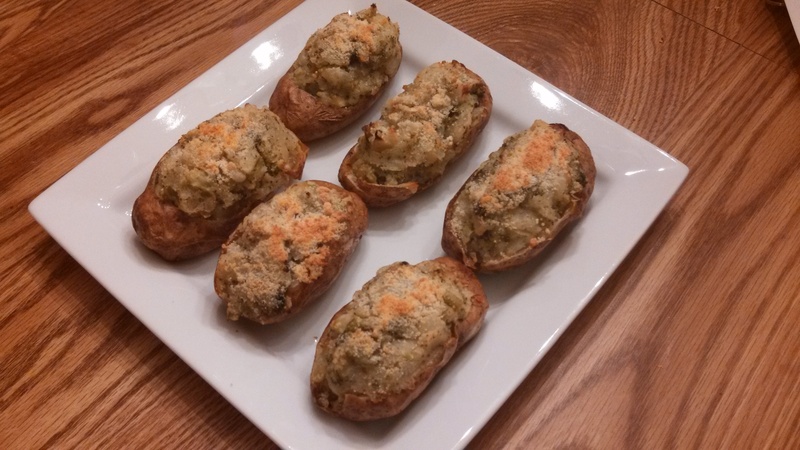 I really like twice-baked potatoes, but they can be just a bit time-consuming to make. I think next time, I might put the potatoes in the slow cooker to cook all day, then stuff and oven bake them at night. For these, I used ranch dressing and broccoli, but there are other variations that could be done as well. For example, sour cream or cream cheese instead of ranch, spinach in place of broccoli, cheddar cheese in place of Parmesan. Or, add in some meat like bacon, cooked chicken or cooked ham. You could make this just as your one-course for dinner having a meat and a vegetable mixed in. Thoroughly wash potatoes and pierce all over with a fork. Place on a baking sheet lined with aluminum foil and bake for 45-60 minutes until soft. Remove from oven and allow to cool for 5 minutes. Once potatoes have cooled, cut tops from potatoes, and scoop out the insides carefully to keep the skins like little bowls. Mash the insides in a medium size mixing bowl. Brush the skins with olive oil and return to the baking sheet. Meanwhile, melt butter in a large skillet. Add onion and broccoli; cook until soft. Remove from heat and stir in with the mashed potatoes. Mix in ranch dressing and grated Parmesan cheese. Spoon the potato mixture into each of the potato skins. It is fine for it to come out of the top of the skin. If desired, sprinkle with more grated Parmesan on top of each potato. Bake in the preheated oven for 15-20 minutes, or until heated through. My mom and sister discovered this recipe on the back of a box of Creamette mostaccioli noodles. It’s a little time consuming to prep, but turns out really tasty! Meanwhile, in a medium saucepan, melt butter. Stir in flour, basil, garlic salt, and pepper. Slowly pour in milk, stirring constantly to avoid getting lumps. Continue to stir and cook until mixture thickens. Remove from heat. Stir in 1 cup shredded cheddar and the Parmesan cheese. Mix in with cooked noodles. Grease a 9 x 13 pan. Spread half of the pasta in the bottom of the pan. Sprinkle with the swiss or mozzarella cheese. Add remaining pasta noodles. Cover with foil and bake in the preheated oven for 25 minutes, or until bubbling. Remove foil and immediately sprinkle with remaining shredded cheddar cheese. Let stand for 10 minutes to cool, and serve. I meant to get a picture of this before we started eating, but forgot! Anyway, I had gotten a package of egg roll wrappers from a friend who wasn’t going to be using them. I didn’t have vegetables for egg rolls, so I decided to explore other things I could use the wrappers for. Turns out there is a lot! My husband and daughter have been asking for lasagna, and I had cottage cheese in the fridge, so it was an easy decision! This was quick to put together and didn’t take too long to bake. This only took 4 wrappers, so I have plenty left to try something new tomorrow night! Now, my husband could tell a difference in using wrappers over dry noodles from a box. I couldn’t tell much different, but wrappers are a lot thinner, so it’s not as bulky. But, something different to try, and if you have a few wrappers left from another meal, this is a great way to use them up. 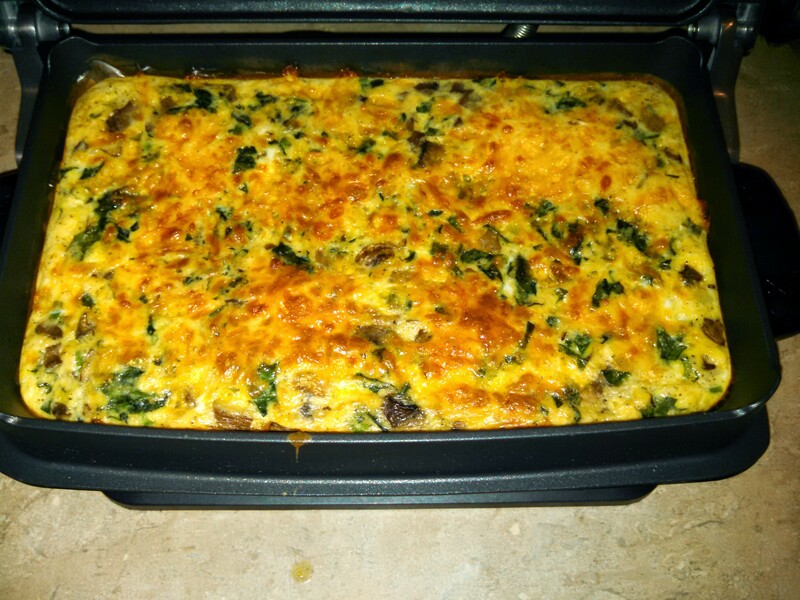 Mix together cottage cheese, egg, spinach, oregano, basil, salt, pepper, 1 cup mozzarella cheese, and 1/4 cup Parmesan cheese. In an 8×8 baking dish, cover the bottom of the dish with a little of the sauce. Place egg roll wrapper down on the sauce. Spread 1/3 of the cheese mixture over wrapper. Spread sauce over the cheese mixture. Then, place a wrapper. Continue until cheese mixture is out and you end with a wrapper on top. Pour remaining sauce over the top. Sprinkle remaining Parmesan and mozzarella cheese on the top. Cover with foil and bake in the preheated oven for 30 minutes. Remove foil, and bake for another 15-20 minutes, or until cheese on top has melted. 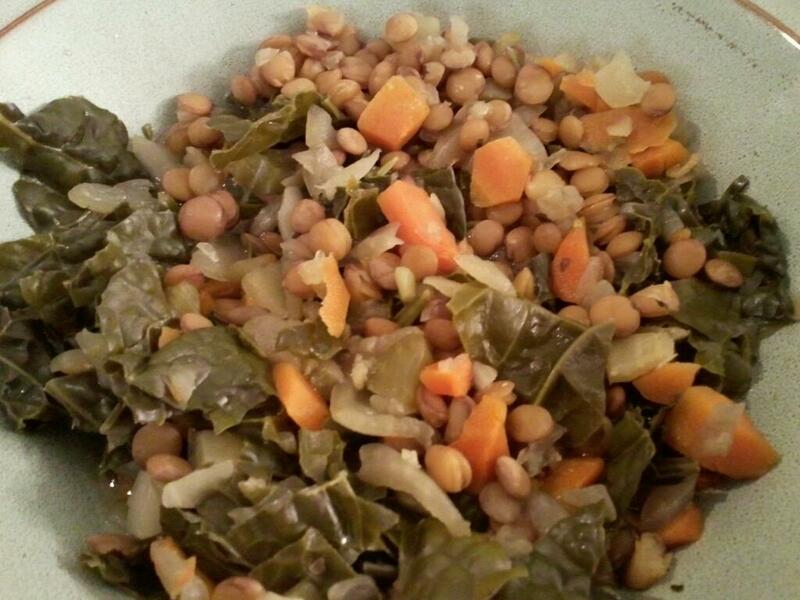 I have been on the hunt for recipes using lentils since I got a 25 pound bag recently from Bountiful Baskets. After getting Tuscan kale this weekend from Bountiful Baskets, I started to look at soup recipes online to see what I could find. So, I came across this recipe, that also used celery and carrots, which I also got from Bountiful Baskets, and onion, which I have plenty of on hand. 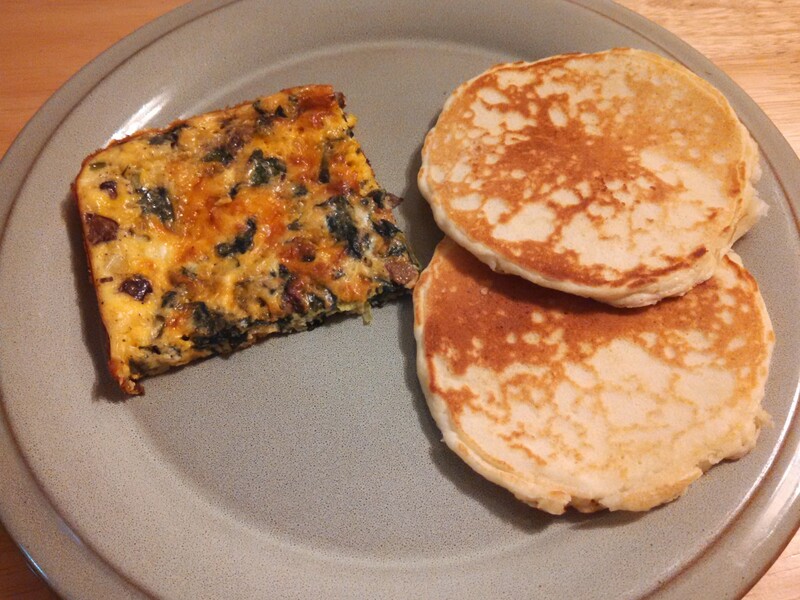 I thought this was very good, my 5-year-old enjoyed it as well, although she ate mostly the kale. My husband and 3-year-old turned up their noses at it, but their loss, more for me! Add all ingredients to the slow cooker. Cook on low for 7 to 8 hours, or high for 3 1/2 to 4 hours. 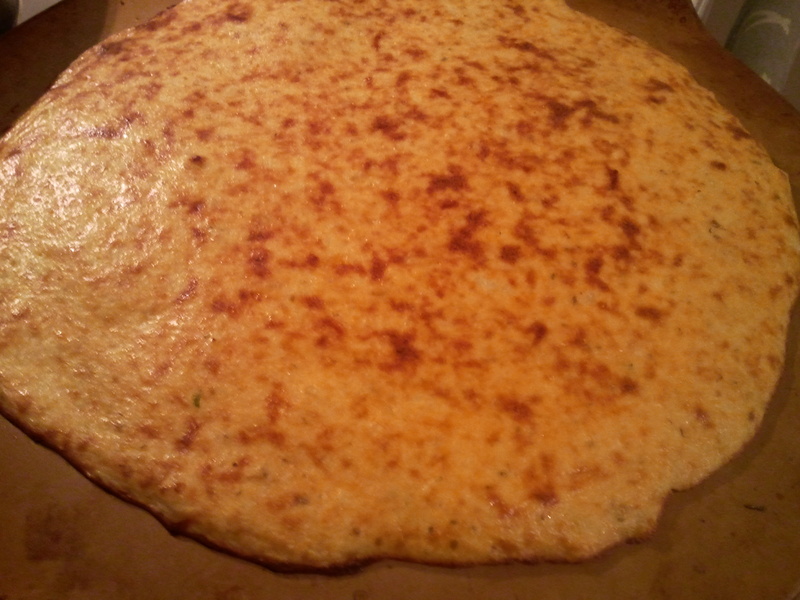 This cauliflower pizza crust is really growing on me. I was skeptical as first, but the second time around, it turned out great again. I did notice that with 1 large pizza, the center stays a little soft, but I think that might be solved by making individual size pizzas. Even with it a little soft, no complaints in this house, and everyone just used a fork to eat it. Even my kids gobbled this up, and I love getting an extra veggie in them for the day hidden in the crust. This time, instead of tomato sauce, I made Spinach Basil Pesto for the sauce. 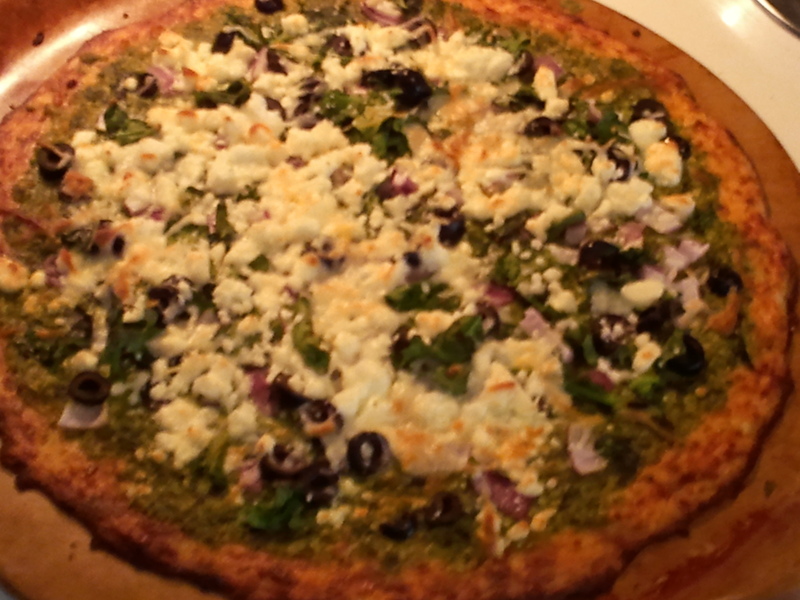 Then, I put chopped red onion, sliced black olives, torn fresh spinach leaves, a 4 oz container of crumbled feta cheese, and a 1/4 cup shredded mozzarella cheese. I had forgotten how much I love feta cheese on pizza. This was a delicious meal! We don’t have any dietary restrictions in my household, but I have some friends who eat gluten-free or low-carb. 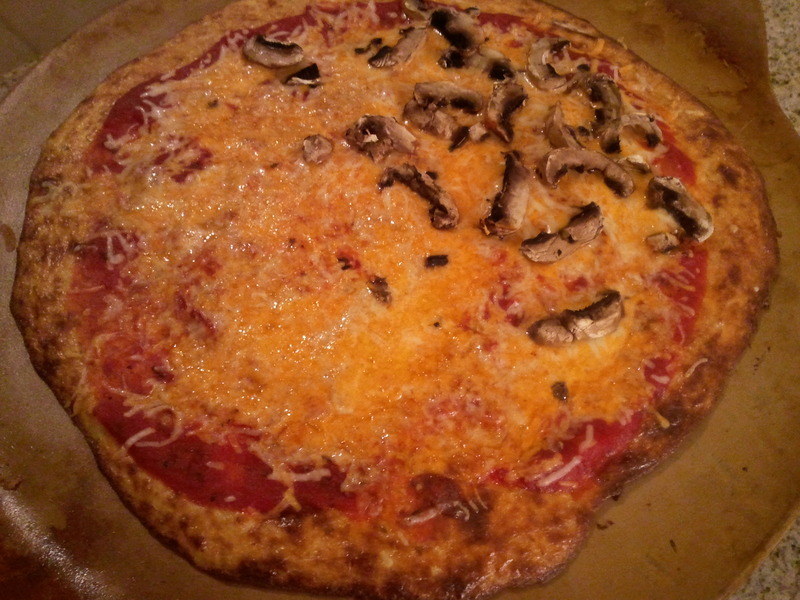 These 2 pizzas are both gluten-free and low carb (I think, correct me if I’m wrong, please!). My friend, Jen, is the one who had posted about the cauliflower pizza crust, and once I saw it, I knew I wanted to try it. I love cauliflower, and it’s been cheap at the store lately. 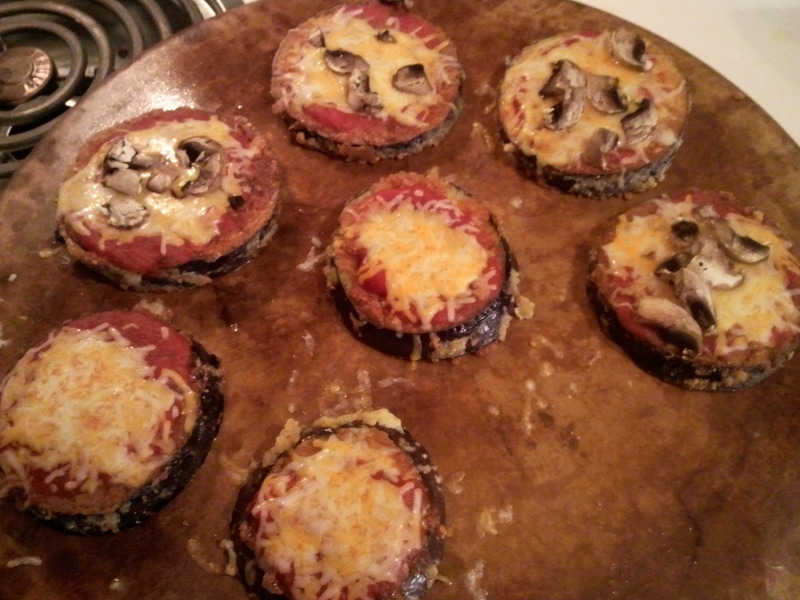 The eggplant pizzas I found on allrecipes.com, I just modified it slightly. You do have to like the taste of eggplant to enjoy this one, but it’s a wonderful way to cook the eggplant. Take the head of cauliflower, remove stems and leaves, and chop the florets into chunks. Add to food processor and pulse until it looks like grain. Do not over-do pulse or you will puree it. (If you don’t have a food processor, you can grate the whole head with a cheese grater). Place the riced cauliflower into a microwave safe bowl and microwave for 8 minutes. There is no need to add water, as the natural moisture in the cauliflower is enough to cook itself. Preheat oven to 450 F. Spray a cookie sheet with non-stick cooking spray. In a medium bowl, stir together cauliflower, egg, and mozzarella. Add oregano and garlic salt, stir. Transfer to the cookie sheet, and using the spoon or your hands, pat out into a 12″ round. Optional: Brush or spray olive oil over top of mixture to help with browning. Beat the eggs in a bowl. Mix the Parmesan cheese, salt, pepper, and oregano in a separate bowl. Dip each eggplant slice in the egg, then in the cheese mixture one at a time, making sure to coat both sides. Heat the olive oil in a large, deep skillet over medium heat. Place the eggplant slices in the skillet to cook, turning occasionally, until evenly browned. Drain the eggplant slices on a paper towel-lined plate. Arrange the eggplant in one layer on a baking sheet. Spoon enough pizza sauce to cover each eggplant slice. Top each eggplant with mozzarella cheese. Bake in the preheated oven until the mozzarella cheese is melted, about 5 to 10 minutes. I had some lasagna noodles in my pantry that I wanted to use, but I wasn’t sure how I wanted to do lasagna. Then, I remembered the Cheese Lasagna Rollups my mom used to get from Market Day, and decided I wanted to try to make some of my own. It worked out that cottage cheese was on sale, and I had spinach, basil, and oregano in my fridge that I needed to use. The filling I made just like my Spinach Manicotti recipe, and the sauce was the Tomato Sauce I made a couple of days ago. It turned out great! Cook lasagna noodles according to directions on box. Drain water and cool on a piece of aluminum foil. Meanwhile, beat eggs in a medium bowl. Stir in the ricotta (or cottage cheese), 1/2 cup of the mozzarella, 1/4 cup of the Parmesan, garlic, spinach, basil, oregano, and parsley. 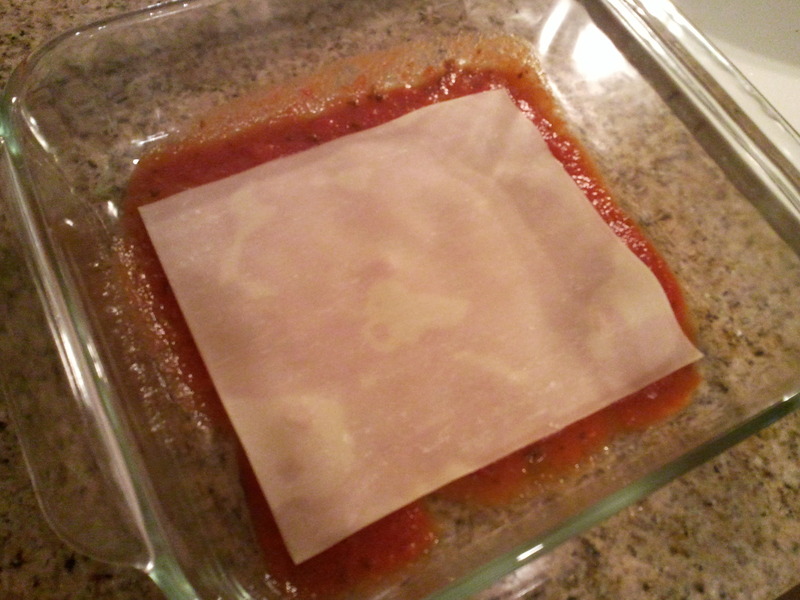 Pour 1 cup of the Tomato Sauce into a 13 x 9 baking dish, or enough to make sure to cover the entire bottom of the dish. Spread filling on each lasagna noodle and roll the noodle. Place seam side down in the dish. Pour the remaining sauce over the rollups, then sprinkle on the remaining Parmesan and mozzarella. Cover tightly with foil. Bake for 30 minutes. 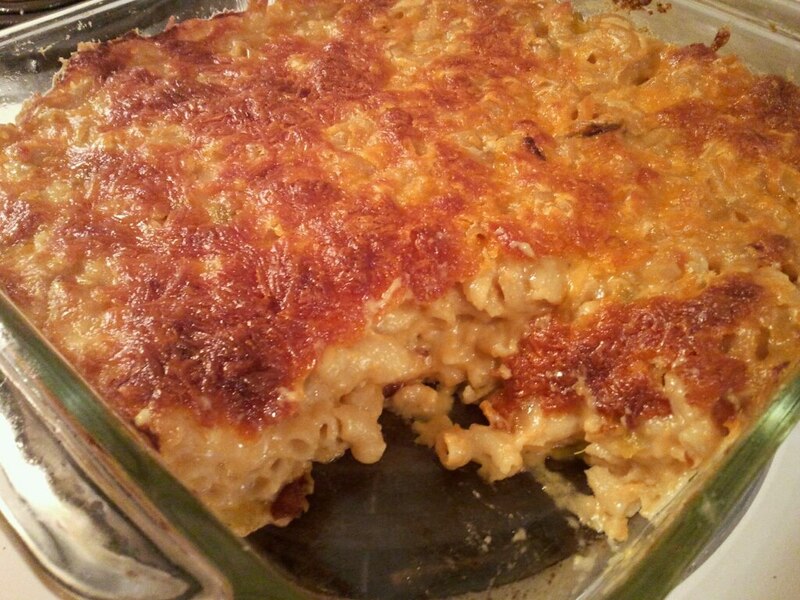 Remove foil, and bake for another 5-10 minutes, or until sides are bubbling and the cheese is melted. 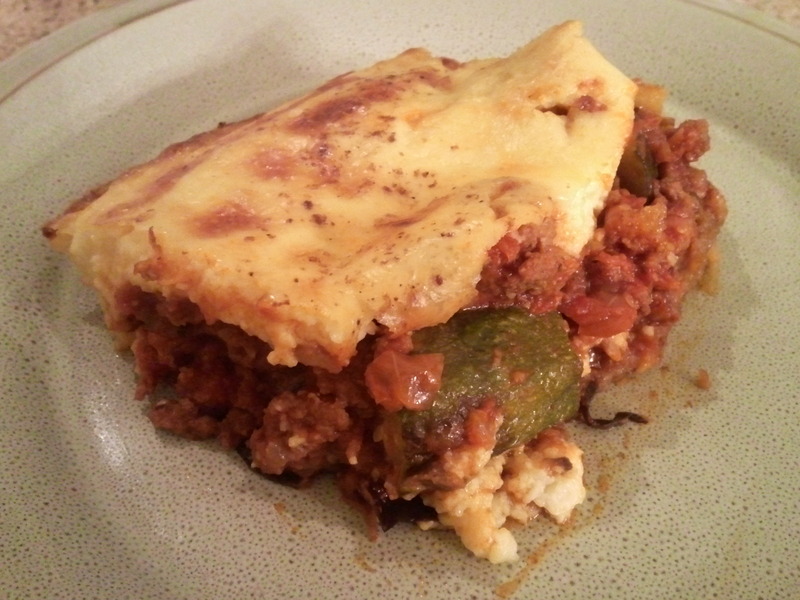 Moussaka is a dish that I have never helped make nor have I made it myself. It’s been on my list of recipes to try for a while, and I knew it was close to Pastitsio, so it shouldn’t be too difficult. 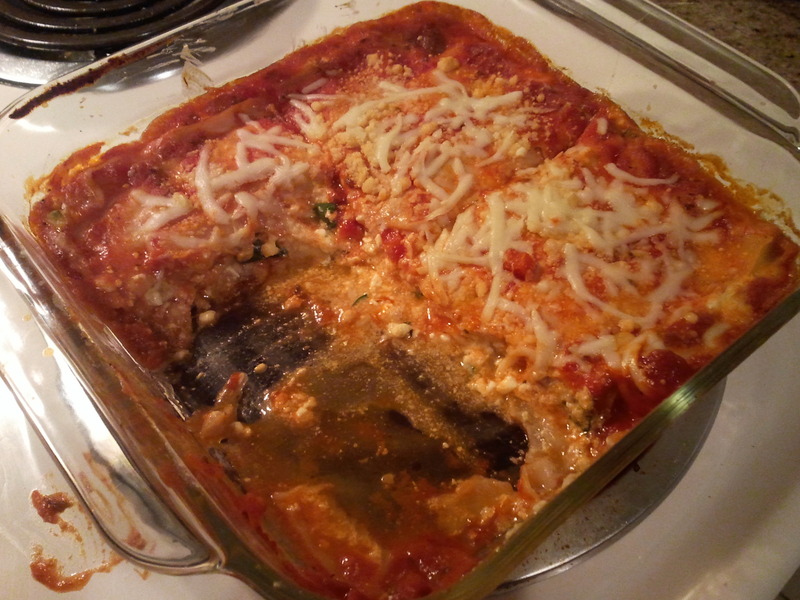 When I got eggplant in my Italian themed veggie pack from Bountiful Baskets, I decided it was time to give it a try. Normally, you would need more than one eggplant, but I decided to make it as an eggplant and zucchini casserole since zucchini was on sale at the grocery store this week. I also wanted to use the mushrooms I got in my basket, so I incorporated them into the meat sauce. It turned out amazing, I’m very happy with the results! 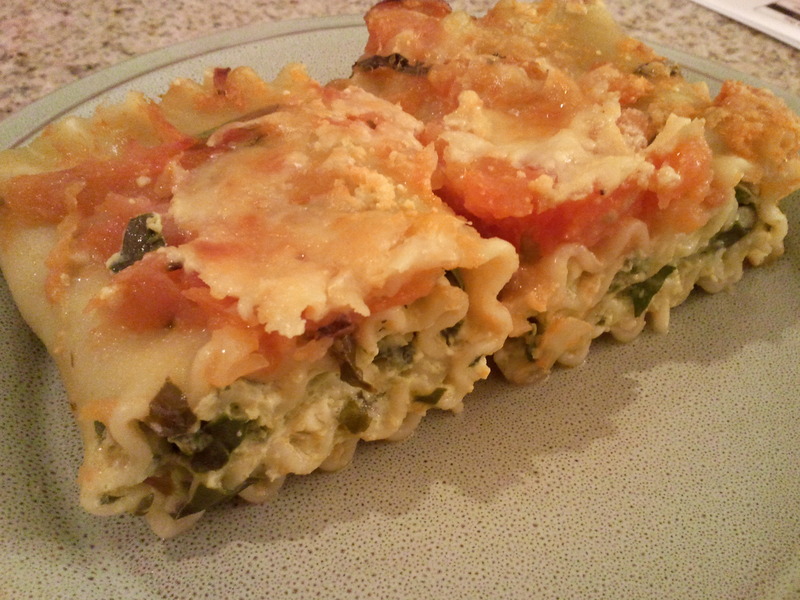 It’s somewhat lighter than Pastitsio, because it’s vegetables instead of pasta. Next time, I think I may come up with a mix of the eggplant, zucchini, and noodles. If you would like to make this meatless, substitute another package of mushrooms, diced, or some diced zucchini and/or eggplant for the 1 lb of ground beef or lamb. Sprinkle eggplant slices with salt and set on paper towels for 15-20 minutes to let them drain. Pat tops with a paper towel. Heat olive oil in a large skillet and brown eggplant and zucchini slices. Drain on paper towels and set aside. Meanwhile, in a skillet, brown onion and ground beef or lamb. Add mushrooms, tomato paste, and seasonings. Cook for 5 – 10 minutes. Meanwhile, make cream sauce. Melt 1/4 cup butter and pour in 1/4 cup flour; brown slowly. Beat 2 eggs with 2-1/2 cups milk, salt, and pepper, and pour into butter and flour mixture very slowly; mix well. Cook over low heat until it thickens. To assemble, grease a 9 x 13 pan. Sprinkle bread crumbs to cover the bottom of the pan. Lay out eggplant in a single layer. Spread half of the meat sauce over the eggplant and sprinkle with grated cheese. Lay out zucchini in a single layer. Spread the remaining meat sauce over the zucchini. Pour cream sauce evenly on top. Bake in preheated oven for 45 – 50 minutes, or until golden brown. Freezes best unbaked, thawed for 1/2 hour, then baked as above.